Randy Pierce of the Middleport Branch of Home National Bank recently presented a check to Vicki Hanson, director of the Meigs County Historical Society museum, as part of a three-year pledge to help with renovation work at the new museum site. 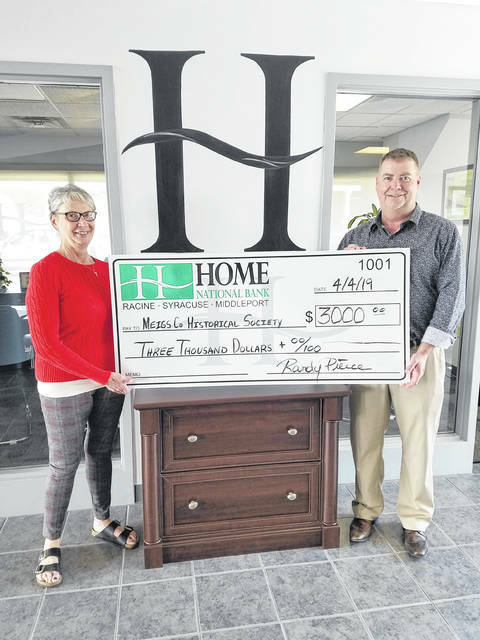 MIDDLEPORT — Home National Bank President Roma Sayre recently pledged $10,000 over the next three years toward the renovation work at the future home of the Meigs County Historical Society in Middleport. Randy Pierce, Middleport branch manager presented the first check to Vicki Hanson, MCHS director. These donations are to help MCHS to get into its new space at 399 South Third in Middleport. Renovation work has been taking place in what will be the main museum building, while the organization is working to secure funds for work in the 1872 building at the back of the property. The main space is nearly complete, and volunteers are needed to assist with clean up, move in and other tasks. Anyone interested in volunteering may call 740-992-3810.